Do you ever get the feeling you’ve forgotten something? It’s a feeling you can’t shake, but you just can’t put your finger on it. The problem is, it often happens when you forgot something very important, something that can ruin an important event, your day, or even worse. As the saying goes, “It’s the little things that matter.” Minor things which seem too insignificant to bother with can have a nasty habit of turning out to be more important than you first thought. The very same thing happens in SEO. Look, I know that there is a lot to remember and it’s easy to overlook some key SEO techniques; in fact, it’s quite common nowadays with all the changes thanks to Panda and Penguin. Or, maybe you just never knew (and nobody bothered to tell you) about some website optimization best practices that are important to Google. Without these tips, your website may not be receiving the rank it deserves. The following on-page optimization tips are so simple and basic, they’re often overlooked. Neglect these important optimization musts and your SEO plan can fail. These are the simple things Google looks for in a relationship. Nobody talks much about sitemaps these days. It’s as if they no longer hold any importance, but this is simply not true. Google considers them important and loves to see—no, expects to see—a clear link to a sitemap on all website pages. Although Google won’t punish a website for not having a sitemap link, it does give a website higher credibility if one is present. Sitemaps are often overlooked during a website build and optimization, even though they’re one of the easiest and most basic items in a good SEO plan. Simply place a link to the website’s sitemap in the footer. This allows it to be universally visible, without having to manually add a link to every page. Google expects to see a sitemap link on a reputable website because an accessible sitemap ensures Google’s bots can locate and index all of a website’s pages. A sitemap is also a useful tool for visitors searching for content deep inside a website’s architecture. Oh, and one more thing: don’t forget to add the sitemap to Google Webmaster tools. By “Watch Your Headings,” I am referring to the HTML tags used for headings. Yes, I know, use of “H” tags are very old school SEO, but their usage is still very important today. Everyone uses them, but the one million dollar question is: Are they using them right? If you’re not familiar with heading tags, they are the H1-H5 HTML tags you see surrounding headings when you look at a website’s source code. The big rookie mistake is to use H1 tags for every heading (including sub-headings). The number beside the H indicates the level of importance. Number 1 is the top dog, number 2 is, well… number two, and so on. Google assumes H tags contain important content, so use them wisely to let Google know what your page is about. Use a H1 heading for the main page/post title (the one with main keyword(s) in it). Use H2 or H3 for major sub-headings. The idea being that each H tag is used in a hierarchical system. The importance of the heading dictates the level of H tag used. Not all websites will have T&Cs or privacy policies, but they are great to have if you can. However, contact information is a MUST. Having clear links to these three items increases Google’s trust in a site. Also, visitors trust websites with open-book policies and Google likes websites that encourage visitor trust. You see, it’s a win-win for both. You can place links to these items in the website’s footer, but contact information should ideally be a main navigation menu item. We know that Google adores social relevance, visitor interaction, and engagement. So let’s give the Big G what it wants, by simply incorporating Facebook Like, Twitter, and Google+ buttons into a website’s content. Google just wants one big interlinked Internet family. Here’s an example scenario: a visitor uses a Facebook Like button to show appreciation of a website’s content. That same person’s Facebook friends see the Like and visit the website. Some of these friends also choose to Facebook Like, Tweet, or share the content via Google+, and a viral promotion begins. That website page/post which just become the center of attention (as in the above scenario) is referred to as being “sticky.” Sticky pages encourage comments, both on-page and on other web platforms. Google places a great deal of value on websites with popular content. So there you have it. These four buried SEO treasures are still as important as ever. Easy to implement and guaranteed to reward. If you’ve overlooked these crucial on-page optimization tasks, do your visitors, Google, and yourself a favor and correct this ASAP—Google as well as your visitors will love you for it! 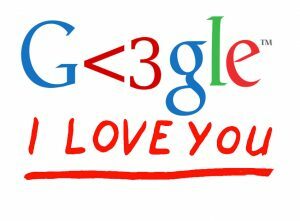 Stay tuned for “Keeping the Google Love Hot,” part two of this series!